Nobody likes to pay fuel surcharges. I tremendously dislike paying them, and often book trips around no fuel surcharge glitches. In fact, two of the trips I have booked in the future are because there was a glitch where fuel surcharges weren’t levied on awards – British Airways First Class with US Dividend Miles, and Asiana First Class with Aeroplan. The easiest way to avoid fuel surcharges is to pay with miles that don’t levy them on awards at all, which are United and Avianca Lifemiles. 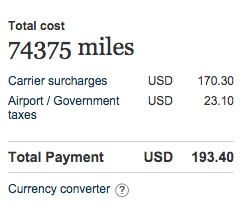 Miles which only have fuel surcharges on British Airways include American and Alaska. 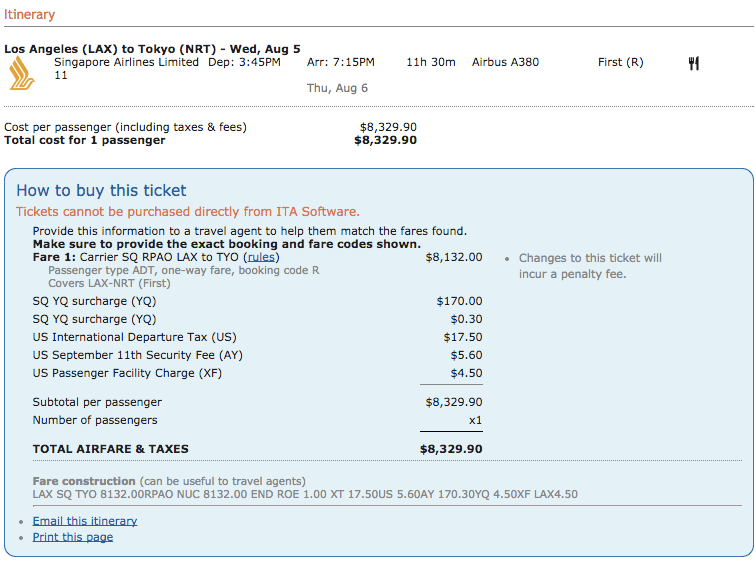 Nearly all other foreign programs tack on fuel surcharges on award tickets. However, if you are stuck with paying fuel surcharges, it’s important to figure out ways to reduce it, by knowing how these surcharges are collected. Today, I want specifically to demonstrate leveraging countries with capped fuel surcharges to reduce the overall out-of-pocket cost of taxes and fees on award tickets. A common misconception with fuel surcharges is that they are to pay for the fuel on the airplane. Although true in some cases, usually, it’s quite arbitrary. In 95% of flight redemptions, fuel surcharges align with a paid fare on ITA matrix. The amount can be found under the YQ, YR or Q Line in the fare breakdown. For example, you can see here that the Singapore Suites ticket has 170 in fuel surcharges under the YQ line. This is exactly the same as the fuel surcharges KrisFlyer would levy on an award ticket. So, for the most part, if the fuel surcharge on a paid ticket is high, the fuel surcharge on a award ticket will be high if the frequent flyer program levies the fuel surcharge. Under the same reasoning, this means paid fares with low fuel surcharges will also result in the award ticket having low fuel surcharges. Finding these “sweet spots” to reduce the amount of fuel surcharges are highly useful. The most common exploit is taking flights originating from Brazil, as Brazilian law prohibits fuel surcharges on award tickets. However, since flights within in the American generally do not have fuel surcharges to start with, it’s less of a value for North American based travellers. Let’s go back to looking at fuel surcharges for Trans-Atlantic travel, specifically flights departing Europe. The only two airlines with First Class across the atlantic worth paying for (in my opinion) are Lufthansa and British Airways. Lufthansa has hubs in Munich and Frankfurt, while British Airways has a hub in London Heathrow. I talked about minimizing fuel surcharges on Lufthansa when booking with Aeroplan before, but there are also other ways you can reduce fuel surcharges for similar awards. The strategy here is using a different departure country. Given the nature of flight hubs, even though British Airways publishes a fare from, say, Dublin to New York, the actual flights you’re going to get on BA are going to be Dublin – London Heathrow – New York. It’s the exact same first class product you’re taking, which means any reduction on fuel surcharge is great. That is exactly the crux of my post. You want to find flight pairs with low fuel surcharges, so you can pay less. What do I mean? As I said, fuel surcharge is highly arbitrary and heavily dependent on the origin and destination. I know (and now you know too!) British Airways has a lowered fuel surcharge on fares from Ireland to North America. 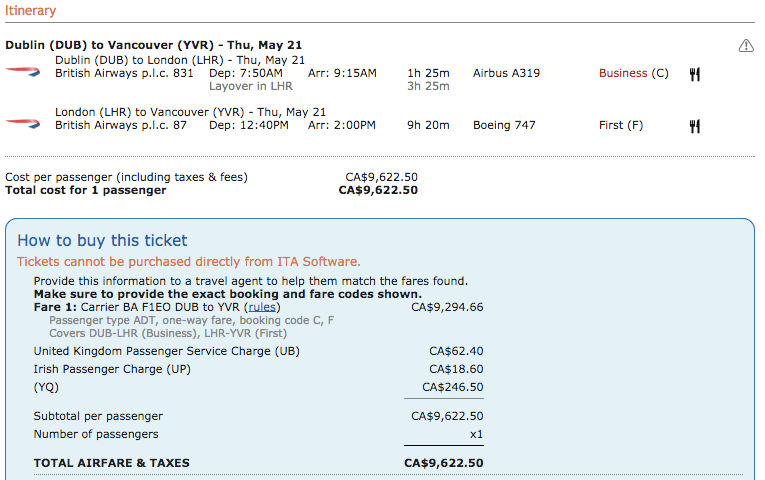 Take a look at the cost of a direct London to Vancouver flight, which will cost 75,000 Avios and $673, $330 of which is the fuel surcharge. 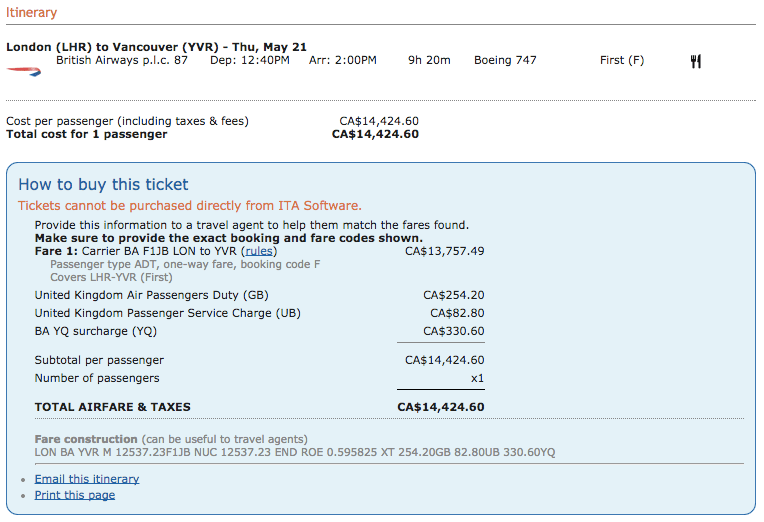 Again, this corresponds exactly with a paid ticket.But an Avios award from Dublin to Vancouver, costs just $324 in taxes and fuel surcharges. That’s over a 50% reduction. A lot of this stems from the connection in London Heathrow since UK Air Passenger Duty (APD) isn’t applied, but there’s still close to a $100 drop in the actual YQ fuel surcharge component of the fare. 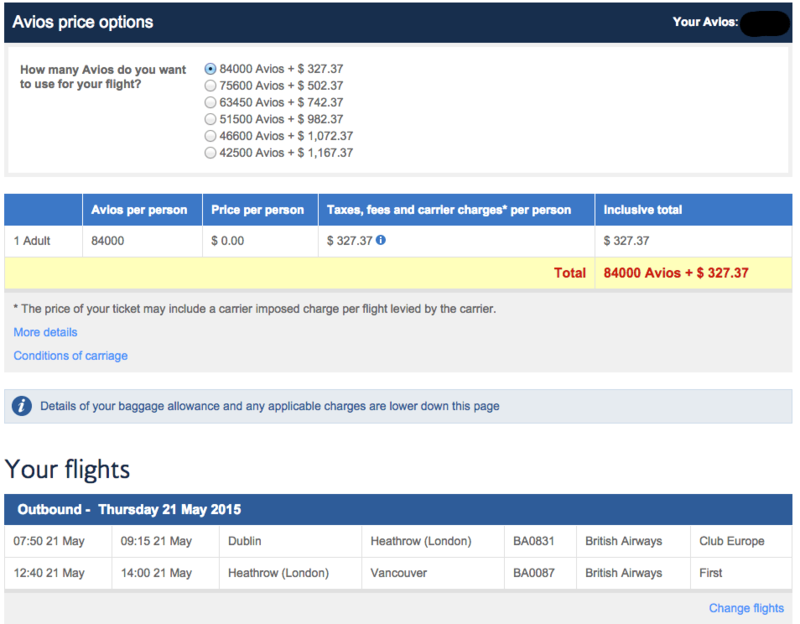 If you were connecting in London, flying, say Brussels – London – Vancouver, you’d also be able to reduce the fuel surcharge by $100, as most fuel surcharges from Europe to North America on BA are $300+ with the exception of ex-Ireland fares. Again, this correlates with the paid fare, where you can see the fuel surcharge (YQ) component drops to $246.50, which is actually not too bad for a 9+ hour flight from Europe to the west coast, given how difficult it is so snag direct flights from Europe to the west coast. Let me show you another instance of this quirk, with Lufthansa First Class. I will use a different departing country to change the fuel surcharges required, and reduce the cost. While Lufthansa First Class is only available to partners (excluding Lifemiles) starting 14 days before departure, having flexibility to book last minute makes one of the easier aspirational redemptions to get. The cheapest way to fly Lufthansa First Class is using Aeroplan, requiring 62,500 miles one-way from Europe 1 to North America. 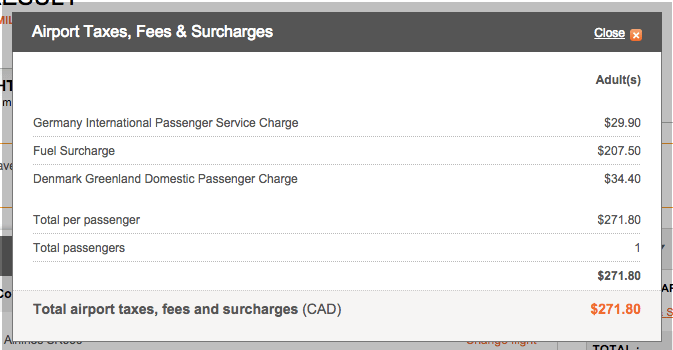 Aeroplan does levy fuel surcharges on Lufthansa. For this award, fuel surcharge application is extremely arbitrary. 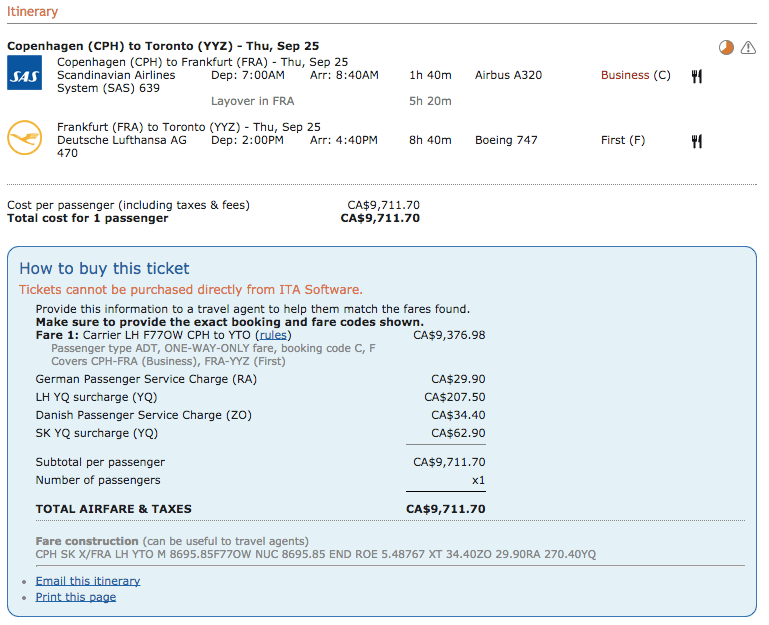 Normally, the fuel surcharge is over $300 for a direct flight from Frankfurt to Toronto, with total taxes at $424. However, if you leave from Copenhagen, that amount drops to $271, due to how Lufthansa publishes their fares from Denmark to North America. Notice this includes only $207.50 in fuel surcharges, a drop again of close to $100. This again corresponds exactly with the paid fare. Leaving from Norway lowers the fuel surcharge even more, but since there wasn’t space, I chose Denmark for illustrative purposes. Nonetheless, that means you could fly Lufthansa First Class for only a $160 USD (~190 CAD) fuel surcharge (departing from Oslo), plus airport taxes, and 62,500 miles. That’s probably as good as it gets, and likely what I’ll be doing if I head to Scandinavia in the near future. You can also call Aeroplan to get much better flights than what’s available online, but that’s for another post, and again what I selected was the limited space that showed up nicely online. A simple way to boost your Aeroplan balance if you’re Canadian is the American Express Gold Rewards Card offers a limited-time bonus of 25,000 miles upon signup and $500 spend within three months, and the first year annual fee waived. AMEX Membership rewards transfer at a 1:1 ratio to Aeroplan. This trick makes much more sense when leaving from Europe, because there are so many countries close by to position, all of which may have a different fuel surcharge amount that’s applied. It doesn’t make so much sense from North America, because generally Canada and the US have similar fuel surcharge amount when heading to Europe. But as you can see, where you’re departing from is crucial in determining how much in fuel surcharges you’ll have to cough up. The saving is way to low to use it. The flight to Norwax, CPH will cost you more and you will loose a whole day! I never meant for you to position specifically just to take advantage of the lower fuel surcharge, but just as a routing to keep in mind if you’re considering a multi-destination trip in Europe. I like this routing. But what’s the chances of getting 2 first class tix on LH? 3 tix? It really depends on the paid loads on the flight. If it’s F8 on a less high profile route (i.e. Frankfurt – Detroit), you’ll have more of a chance, than say Frankfurt – Los Angeles. I’ve seen two seats a few times when I’ve looked for Lufthansa First Class, and three seats perhaps once or twice. I don’t understand how this is a “trick”. Currently, I’ve booked a business award out of FRA to IAD on OS via VIE. Since I’ve already experienced business on OS, I’m thinking of switching to first on LH closer to my departure. Unless I specifically want to travel through Scandinavia, how could I take advantage of the lower fuel surcharges? 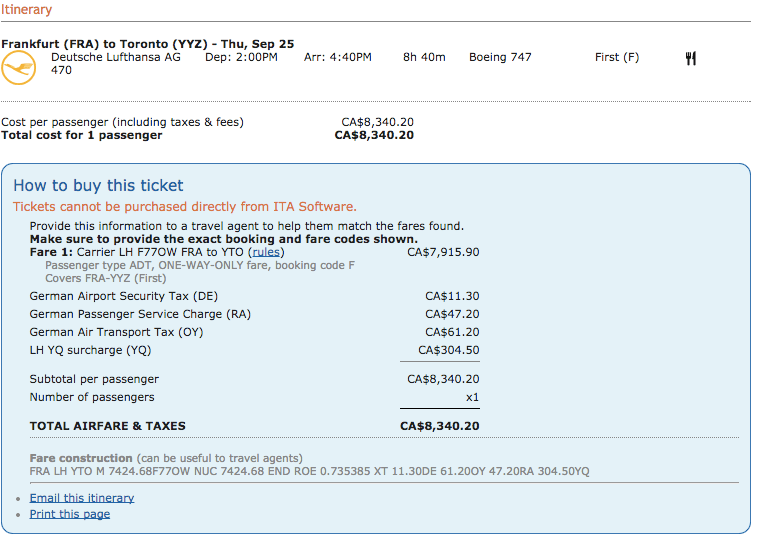 It would be awesome to pull that off, considering I’m going to have to eat a change fee to switch my ticket. This is because the fuel surcharge for ex-Scandanvia departure is around ~$150, where the fuel surcharge from Germany or the UK or other European countries is ~$350. So if you were in London, and wanted to fly Lufthansa First Class, it might make sense to use Avios/LCC to Oslo, and fly Lufthansa from there – it’d be cheaper and you’d get to visit Scandinavia as well. You could only take advantage of this if you change your ticket to depart from Scandinavia.